By Douglas Bakshian Filipino analysts say Thursday’s botched coup attempt at a luxury hotel in Manila was politically embarrassing for the Philippines, which has experienced numerous coup plots in the past two decades. FACTBOX: Who matters in Pakistan’s election? By VOA News European Union foreign policy chief Javier Solana is meeting in London with Iran’s chief nuclear negotiator, Saeed Jalili, to discuss Tehran’s controversial nuclear program. 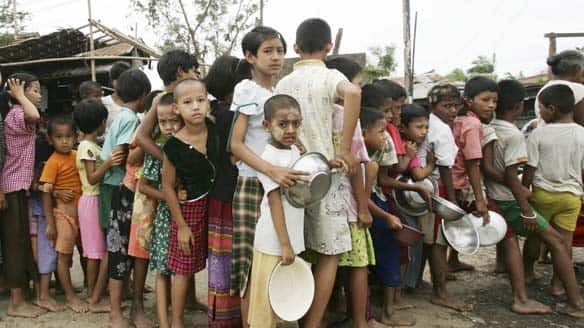 Of the nations not represented, there is no Miss Myanmar (formerly Burma) and most Muslim-majority countries do not take part, although Miss Malaysia, ..
President Bush is urging Congress to approve the doubling of the U.S. commitment in the global fight against HIV and AIDS. By Karen Lema and Raju Gopalakrishnan MANILA (Reuters) – Philippine police gave around two dozen rebel soldiers until 3 pm (2 am EST) on Thursday to halt their attempted mutiny in a luxury hotel in Manila’s financial district. By Molly Moore PARIS, Nov. 28 — President Nicolas Sarkozy received no celebratory homecoming when he returned from Beijing on Wednesday with $30 billion in new business deals between France and China. WASHINGTON (CNN) — The United States has filed a formal protest with China over the decision to deny port visits to a US aircraft carrier and two other ships last week, an incident a Pentagon spokesman Wednesday called “baffling. 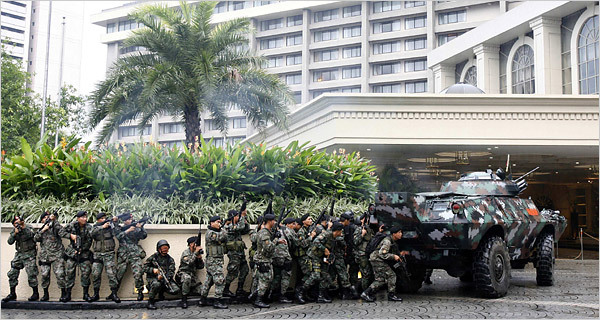 Government soldiers prepare to the Peninsula Hotel in Manila. The hotel had been taken over earlier by dissident military officers who demanded that President Gloria Macapagal Arroyo resign. 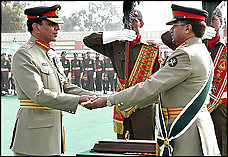 By CARLOTTA GALL and JANE PERLEZ ISLAMABAD, Pakistan, Nov. 29 – A day after resigning as army chief, Pervez Musharraf was sworn in as a civilian president today. The ethnic Vietnamese activists, among them a US national mathematics researcher, a French national journalist and a Thai citizen, were arrested while handing our fliers that explained and promoted non-violent struggle for democratic change. bkbangash/AP Pakistan’s President Pervez Musharraf gave an emotional speech after he was sworn in as the country’s civilian president today in Islamabad, Pakistan. 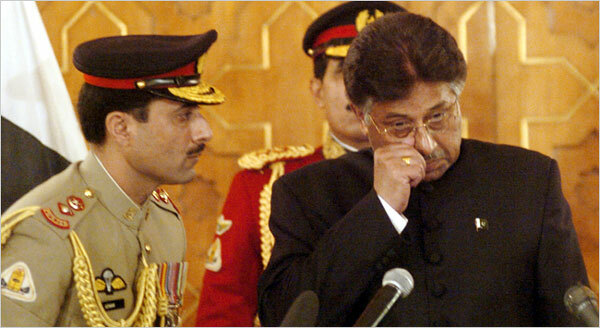 President Pervez Musharraf speaks after taking the oath of office for a five-year term as a civilian president November 29, 2007 at the presidential palace in Islamabad, Pakistan. The recent “saffron revolution” in Burma presented China with not only a challenge, but also an opportunity to exert its influence. ..
Myanmar Investment: Right or Wrong? Amnesty International has condemned the continuing arrests of political activists inside Burma despite what it says was the government’s pledge to stop. 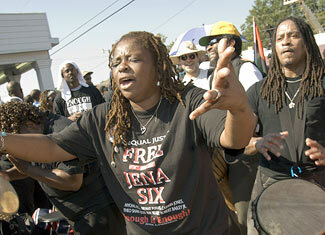 The London-based rights group on Tuesday published details of the arrest of several activists since early November. Amnesty says Burmese Prime Minister Thein Sein made a commitment to Ibrahim Gambari to halt the arrests when the U.N. special envoy met with him earlier this month. Burmese officials say 15 people were killed and nearly three-thousand detained in the September crackdown. Diplomats and human rights groups say the figures are much higher. Also Tuesday, a British academic organization gave Burmese opposition leader Aung San Suu Kyi a lifetime achievement award. She has spent 12 of the last 18 years under some form of detention and remains under house arrest in Rangoon. This Information has been provided by the burmese service advisory, political studies association, amnesty international. A Burmese human rights campaigner, Zoya Phan, accepted the Political Studies Association’s special award for lifetime achievement in politics on her behalf during Tuesday’s award ceremony in London. Aung San Suu Kyi’s National League for Democracy won elections in 1990, but Burma’s government refused to recognize the results and prevented the party from taking office. See Zoya Phan’s YouTube video at the right side bar .